The win moves the 17th-placed Canaries six points clear of the Magpies who are 19th but have played one game fewer. Timm Klose gave Norwich the lead with a first-half header before Aleksandar Mitrovic nodded in after 71 minutes. Mitrovic levelled again, this time from the spot, after Dieumerci Mbokani's superb strike had made it 2-1, before Olsson rifled in a low, angled winner. Will Newcastle recover from this? The manner of this defeat will hurt the Magpies. Up until the 93rd minute Serbia striker Mitrovic was set to hog the headlines. The 21-year-old - who scored the equaliser in the Tyne-Wear derby - was once again Newcastle's hero, twice equalising having entered the action in the 62nd minute. The momentum was with the visitors, and a first win must have gone through manager Rafael Benitez's mind when he saw Papiss Cisse's header drift towards the top corner, only for John Ruddy to produce an incredible save. The Spaniard would have been happy with a point, but that hope was snatched away from him when Newcastle's porous defence was once again found wanting by left-back Olsson, whose late gamble to get forward into the opposition's area paid off. It has been quite a fortnight for Mbokani. The Canaries frontman declared it was a "miracle" he was alive having been at Brussels' Zaventem Airport during the attacks on 22 March. At Carrow Road he received a warm welcome from the home crowd and delivered an outstanding display. The 6ft 1in DR Congo striker won eight of his nine aerial duels (89%), provided four key passes and had three efforts on goal - one of which resulted in a goal. That 71st-minute shot was a stunner. The Canaries display as a whole was in stark contrast to the one in the reverse fixture in October at St James' Park where they succumbed to a 6-2 defeat. It is now seven points from nine for the Premier League's youngest manager, 34-year-old Alex Neil. Norwich manager Alex Neil: "It was a strange game but we were the better team throughout. It looked as if we were going to fail to capitalise but that's the best way to win a game. "We went through the other side against Liverpool, conceding in the last minute of stoppage time, so huge credit to the players. We have great spirit here and we showed that in abundance. "Today was a pity. We conceded in the last minute of the first half and then we reacted well but we are disappointed. We worked hard but it is not enough to win games. We have seven games to go and we have to keep pushing. "When we scored the second goal we were on top but we make a mistake and concede. It can happen when you don't have too much confidence but we have to change it for the next game. "Now it is more difficult but we have to keep confident that we can still do it. What upsets you more is the way that we concede in the last minute of each half. "If we start winning games we still have time." Newcastle have lost each of their last eight away games in the Premier League - their longest run without a win on the road in the league since a nine-game run between May-October 1977. 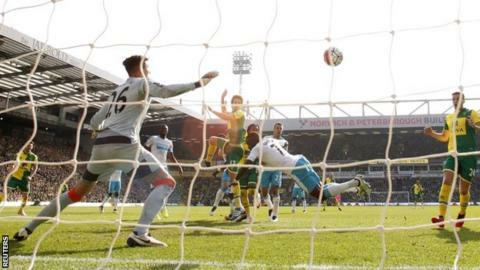 Norwich recorded their first win at Carrow Road in the Premier League in six attempts. There were just 130 seconds between Mitrovic's first equaliser and Mbokani's goal. Mitrovic has scored as many Premier League goals in his last two games (three) as he did in his previous 18 combined. Mbokani scored his first Premier League goal in nine games. Will Norwich make it three wins on the spin at Crystal Palace next Saturday? The struggling Magpies are at Southampton. Match ends, Norwich City 3, Newcastle United 2. Second Half ends, Norwich City 3, Newcastle United 2. Goal! Norwich City 3, Newcastle United 2. Martin Olsson (Norwich City) left footed shot from the left side of the box to the bottom right corner. Assisted by Jonny Howson. Attempt missed. Chancel Mbemba (Newcastle United) header from the centre of the box misses to the left. Assisted by Andros Townsend with a cross following a corner. Corner, Newcastle United. Conceded by John Ruddy. Attempt saved. Papiss Demba Cissé (Newcastle United) header from the centre of the box is saved in the top right corner. Assisted by Aleksandar Mitrovic with a headed pass. Corner, Newcastle United. Conceded by Andre Wisdom. Attempt missed. Aleksandar Mitrovic (Newcastle United) header from the centre of the box is close, but misses to the left. Assisted by Georginio Wijnaldum with a cross. Attempt blocked. Nathan Redmond (Norwich City) right footed shot from outside the box is blocked. Assisted by Cameron Jerome with a headed pass. Goal! Norwich City 2, Newcastle United 2. Aleksandar Mitrovic (Newcastle United) converts the penalty with a right footed shot to the bottom right corner. Penalty conceded by Gary O'Neil (Norwich City) with a hand ball in the penalty area. Corner, Norwich City. Conceded by Chancel Mbemba. Corner, Norwich City. Conceded by Moussa Sissoko. Offside, Norwich City. Ryan Bennett tries a through ball, but Dieumerci Mbokani is caught offside. Substitution, Norwich City. Wes Hoolahan replaces Steven Naismith. Attempt missed. Steven Naismith (Norwich City) left footed shot from outside the box is too high. Assisted by Dieumerci Mbokani. Attempt missed. Aleksandar Mitrovic (Newcastle United) header from very close range misses to the left. Assisted by Moussa Sissoko with a cross. Attempt missed. Aleksandar Mitrovic (Newcastle United) header from the right side of the six yard box is close, but misses to the right. Assisted by Jonjo Shelvey with a cross. Substitution, Norwich City. Nathan Redmond replaces Matthew Jarvis. Goal! Norwich City 2, Newcastle United 1. Dieumerci Mbokani (Norwich City) right footed shot from the left side of the box to the high centre of the goal. Assisted by Jonny Howson. Attempt blocked. Ryan Bennett (Norwich City) right footed shot from the centre of the box is blocked. Assisted by Dieumerci Mbokani with a cross. Steven Naismith (Norwich City) wins a free kick on the right wing. Goal! Norwich City 1, Newcastle United 1. Aleksandar Mitrovic (Newcastle United) header from the centre of the box to the top left corner. Assisted by Andros Townsend with a cross. Offside, Newcastle United. Andros Townsend tries a through ball, but Daryl Janmaat is caught offside. Attempt saved. Aleksandar Mitrovic (Newcastle United) left footed shot from the centre of the box is saved in the bottom right corner. Assisted by Moussa Sissoko with a cross. Attempt missed. Andre Wisdom (Norwich City) left footed shot from outside the box is too high. Assisted by Robbie Brady. Offside, Newcastle United. Aleksandar Mitrovic tries a through ball, but Papiss Demba Cissé is caught offside. Attempt blocked. Andros Townsend (Newcastle United) left footed shot from the right side of the box is blocked. Assisted by Daryl Janmaat. Foul by Matthew Jarvis (Norwich City). Substitution, Newcastle United. Aleksandar Mitrovic replaces Vurnon Anita. Corner, Newcastle United. Conceded by Jonny Howson. Corner, Newcastle United. Conceded by Martin Olsson. Corner, Newcastle United. Conceded by Timm Klose.